This was Arwen’s first show since April. She boxed great, but was a little sweaty when we got there. We headed for the warmup and she proceeded to engage full dragon mode. Like – she was rearing. And bucking. And bolting. I feared for my life, or at least for anything flammable in the immediate surroundings. True to form, she actually stayed pretty obedient in between the rearing and blowing flames at stuff. 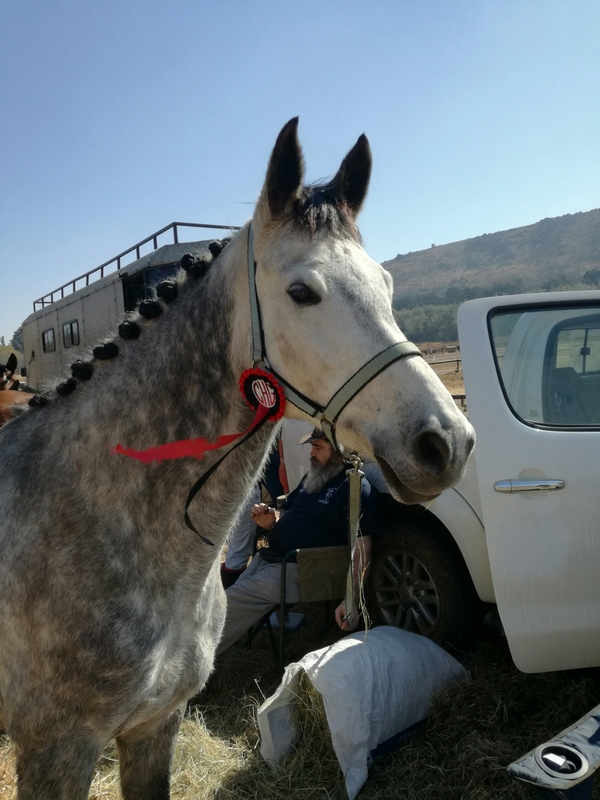 We dragoned majestically up to the judges, leaving them with mildly singed eyebrows, and headed down centreline with minimal straightness and maximum sass. I couldn’t get the grin off my face. She wasn’t scared really; she was just alive and fit and bursting with the exuberance being created. Who could blame her? I was filled with a sort of grateful giddiness that had nothing to do with horses. What’s a dressage test going downhill in a handbasket compared with knowing Christ the King? In the end, though, the tests themselves weren’t that bad. She settled as we went on. We broke to jog in our medium walk once, but we got the simple changes in Elementary 4, earning 60% and a third place ribbon. 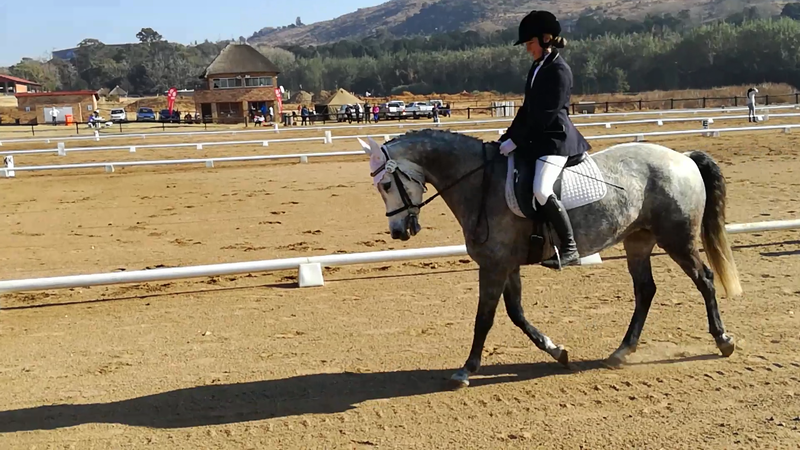 Elementary 5 was a bit floppy; I got lost and got the -2 for error of course, and we kind of swooped down into the simple change, then proceeded to break to trot for half a stride after the medium canter and throw a random flying change in the counter canter. So we got two nice fat 4s for that. Still, 57% – so it’s grading points. We have 5 in total now, halfway to points for EM, although we’ll likely never actually do it. Thunder was so quiet to plait, merely dragging L’s hapless boyfriend around a bit. He hacked obediently to the warmup away from his buddies. The warmup itself started out rather worried and we had two tremendous sideways spooks when birds flew out of the grass (seeing how he’s never seen a bird before), so I was kind of expecting a disaster and resigned myself to just giving the dude a positive experience. He never quit trying though. Again, worried as he was, he stayed obedient and got it together for me. I don’t deserve them, I really don’t. So we headed down centreline in Prelim 2 and suddenly he was totally fine. Happy even – and relaxed enough for a killer free walk. I don’t want to sound melodramatic, but Prelim 3 wasn’t a test, it was a dance. I wasn’t concentrating all that hard. Not on the test, anyway. The sky – and heaven – was very big and blue, and so close. Close enough to kiss, or be kissed, perhaps. Either way, it was amazing, and I’m not talking about the riding. 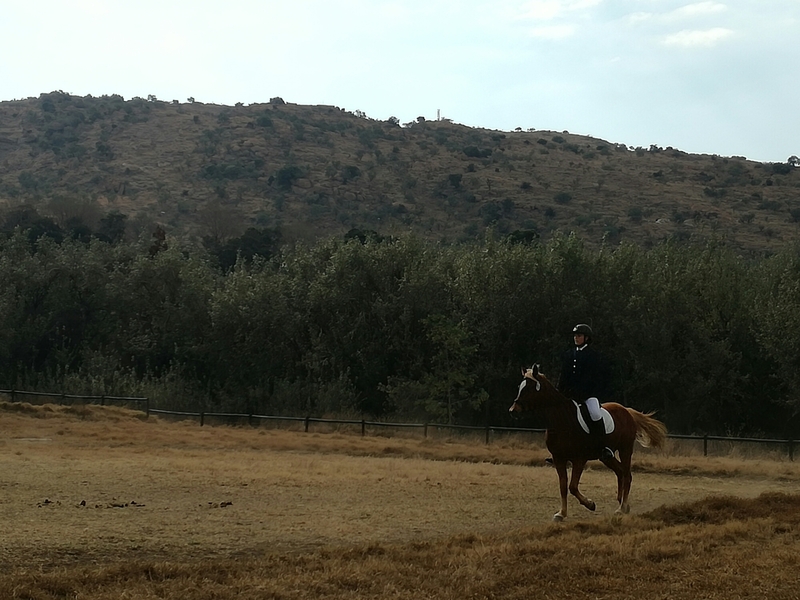 The riding was good too though. The judge said she wanted to take Thunny home and keep him. I don’t blame her because he was so, so good. He was worried at first but he coped, then eventually relaxed into it and just revelled in the joy of it. He won Prelim 2 with 65.91% and Prelim 3 with 72.5%. He had 8 for his free walk and 8s for both his canter-trot transitions. 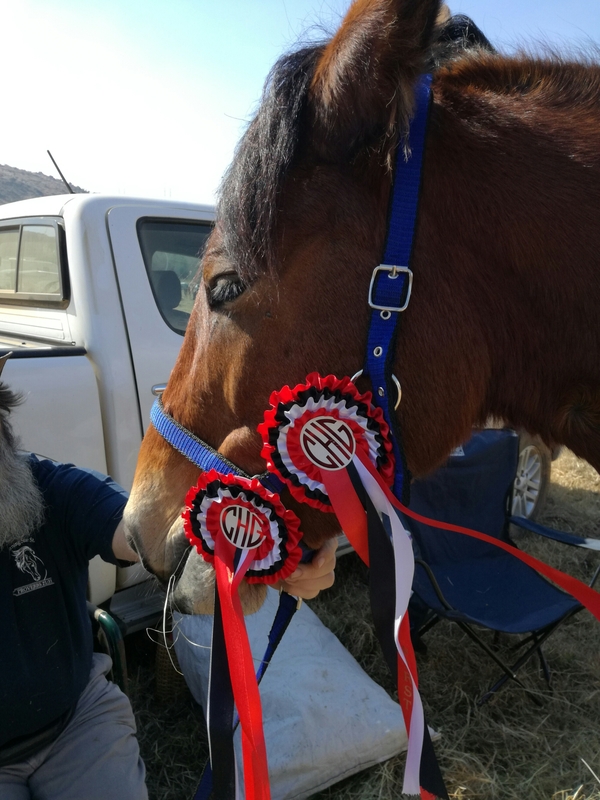 The first judge would have liked him more forward – I think I was still being quite conservative, waiting for a spook – and his stretchy trot didn’t really stretch, and his halts weren’t square. But that’s actually kinda exciting because it means this horse can do even better. So he didn’t improve on his Prelim 2 score from last time, but he did get 72% on Prelim 3, so that’s a huge win. So I actually couldn’t have asked for better from my dance partners, and it was amazing. Then K and Renè had their prelim tests and despite Renè having a naughty moment in the warmup, she settled right down and K rode her nicest tests yet. 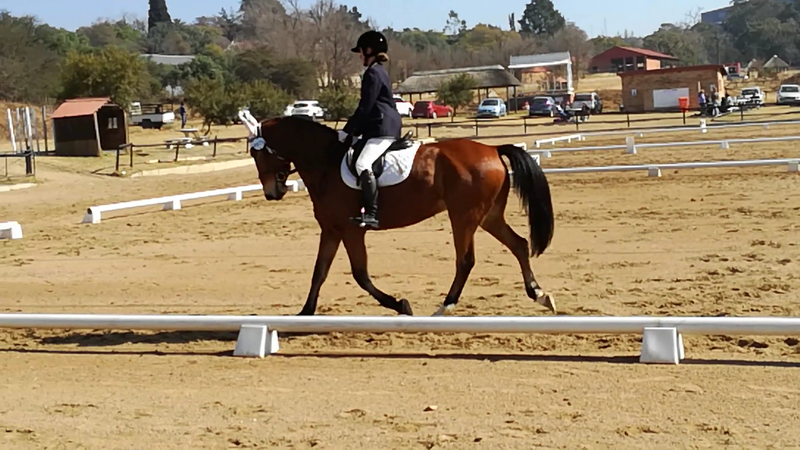 It was Renè’s first dressage and she got 58% and 60%, not shabby at all. K brought her on all by herself, too. 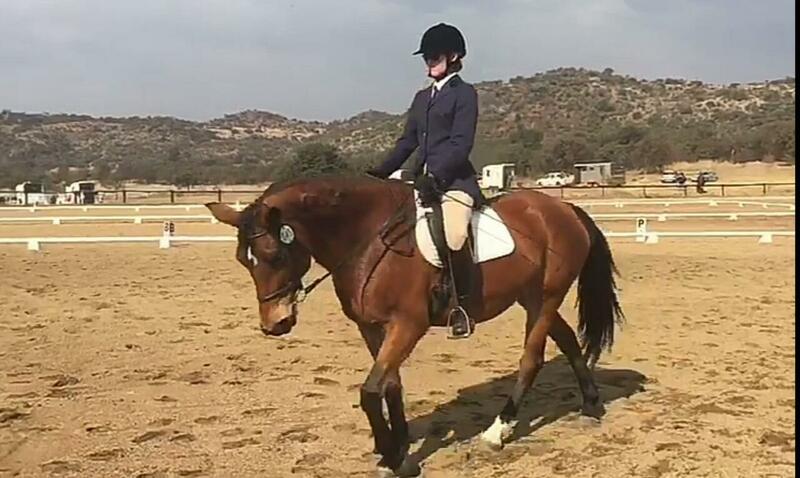 Then it was the moment of truth – Destiny’s mom was riding him at his first ever outing at walk/trot 2. And you know what? He was brilliant. Delinquent Destiny who broke my lunging ring twice – he didn’t put a toe out of line. He didn’t buck, he didn’t run away, he didn’t even spook. He just squiggled down the centreline and whinnied a few times, that’s all. When he came fourth with 60%, well, it was just the cherry on top. As for my goals, I don’t really know about the rest, but love, joy and peace? They all showed up. How mighty is amazing grace. Glory to the King. It was a lovely, chilled, happy show.